On November 19, 1971 at F Space in Los Angeles, a young Chris Burden stands in the middle of a white walled gallery. Not far from him, another man with a rifle exchanges a few words, takes aim, and a gunshot is heard. During the same period in San Francisco at MOCA [1970-84], Paul Kos arranges a vast array of microphones focused on two blocks of melting ice. At the same exhibition, in front of an attentive audience, distinguished conceptualist and curator Tom Marioni climbs a ladder and urinates into a metal washtub 5 feet below. Forty years later, a new wave of Bay Area Conceptual Artists continue to explore the boundaries of art through performative actions. At the Park Life opening Josh Short will be frying fish outside with its amplified sound broadcast over the FM airwaves within the confines of the gallery. From 1998-2003, Guy Overfelt’s “relic” comes from his series of Trans Am performances that exhibit the sound and imagery of burnt rubber on pavement: using the classic American car as his performative tool. Mauricio Ancalmo’s kinetic sculpture challenges the use and product [relic] of the viewer’s experience by visualizing sound through light using discarded objects, questioning what is “out dated” technology, giving those objects new function and expropriating them for the purpose of art. For centuries relics have been associated with religious activity. Only recently, at the advent of Happenings, the Japanese Gutai movement and Fluxus, have artists begun participating in performance art pieces that create no product but leave behind traces of the action, such as posters, programs, photography and video. But do relics have to have physical properties? Can the sound of frying fish become the performative relic. Can it be a sense memory? And are these fleeting invisible memories more true to the nature of the action than mediated responses?. Gunshots, urination, burning cars, white noise, food frying, radio static, can now be manipulated by the artist for creative purposes. Which is more important – the action, or spectator’s memory of said action? 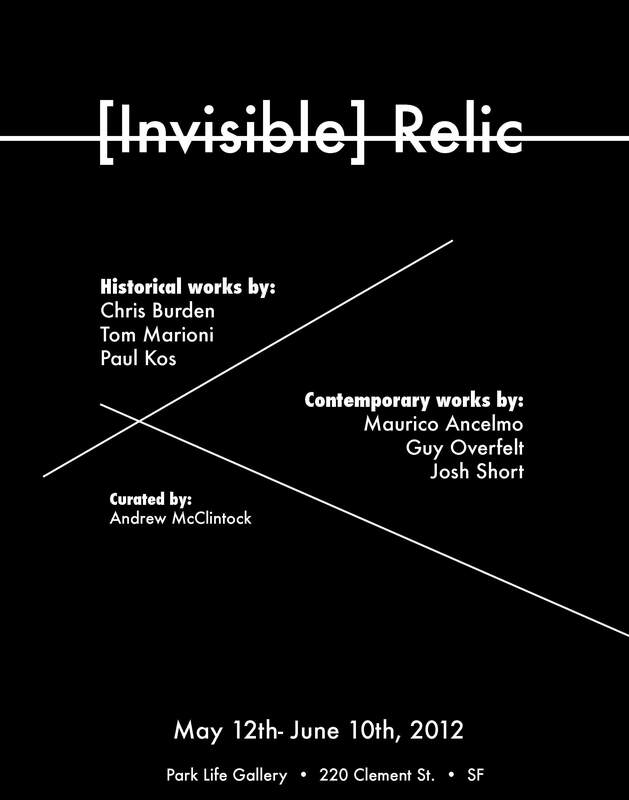 What happens when invisible relics are collected and “exhibited” in a gallery setting? 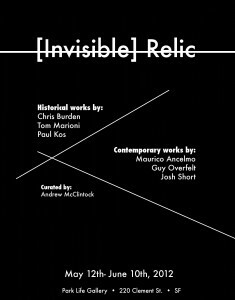 “(Invisible) Relics,” addresses these concerns in a cross-generational reappraisal of the primacy of the art object.